The Arch Rival™ represents DonJoy's first patented pre-fabricated orthotic designed to treat Subtle Cavus Foot by promoting natural foot function, improving stability, adding shock absorption and alleviating pain. Say Goodbye to Foot and Heel Pain with WonderZorb Soft Silicone Orthotics-the #1 product recommended by medical professionals. Silicone is the secret! A recent, widely published study found that high performance soft silicone cushions can relieve sore, aching heels, ankles, knees and back more effectively than custom orthotics costing hundreds of dollars. WonderZorb are made of a breathable, skin-like medical grade silicone that does not dry out. It is hypo-allergenic, non-toxic, odorless, fully washable and will not flatten under repeated pressure from walking or standing. Without correction, the big toe will not be able to return to its natural position any more. One of the most common clinical pictures is the hallux valgus, a deformation of the big toe in the shape of an X. Shoes that are too narrow, high-heeled or too small do not give the big toe any room for a natural position. Without correction, the big toe will not be able to return to its natural position any more. The valgus position may then be so marked that in the shoe the big toe will be forced under the neighboring toes. 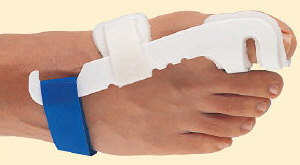 The consequence: Great pain from putting load on and moving the toe which make natural walking and standing impossible. The anatomical shape of the BORT Valco® gives the basic joint of the big toe the right position for correction. The Heel Jack™ helps hold the foot in plantar flexion to remove stress from the heel and Achilles' tendon. This low profile device is easy to use and designed to be worn inside the shoe. Effective Treatment for Achilles Tendonitis. The Solution for Diabetic, Rheumatoid and Insensitive Feet. The Silipos® Soft Sock™ is a two-layer sock carefully designed with a proprietary gel pad molded in between the two fabric layers at the sole to absorb and reduce friction, abrasion, shear forces, and moisture away from the foot. Gel Therapy Socks help prevent dry cracked skin without the use of messy creams and lotions for people with diabetes or other dry skin conditions. Gel Therapy Socks are washable and reusable. Provides mild compression to help reduce swelling in and around the anklebone. Comfortably conforms over the ankle to moisturize your skin while they cushion and protect your ankle. Can be used to provide an additional protective layer to help prevent injuries. Helps relieve Ball of Foot Pain. Our Metatarsal Universal Gel Strap features an anatomically-shaped pad of soft polymer gel molded on an elastic sleeve that fits comfortably over the forefoot. The gel pad cushions and protects the painful forefoot/metatarsal area of your foot. Tuli's Gaitors will provide immediate and maximum relief for the common painful conditions known as Planter Fasciitis (heel and arch pain) and Heel Spurs (painful heels). The unique character of TuliGEL, combined with our patented waffle design, provides the ultimate in shock and absorption. Use Standard Gel Heel Cups for everyday use and Heavy Duty heel Cups for high impact activities. Tuli's New Double-Ribbed Standard heel cups provide relief from the everyday pain of heel strike. Worn in your shoes, Tuli's Standard Heel Cups will help prevent sore heels and knees, shin splints and heel spurs. Tuli's Double-Ribbed Pro heel cups are the most advanced shock absorbing heel cups available today. The primary force of the heel strike is absorbed by the larger and higher waffle pattern while the lower and denser waffle pattern absorbs the "high pressure" and final force spike of heel strike. Perfect for sports activities. At last! ...Instant relief for tired, swollen, aching metatarsals. TuliGEL Metatarsal Cushions relieve that agonizing forefoot pain when wearing high heel fashion or dress shoes. TuliGEL Personal Fatigue Mats have been scientifically and medically designed to protect your feet from hard, unyielding surfaces. The unique tic-tac-toe soft waffle pattern interrupts the shock waves created while walking or running, helping to prevent fatigue, tired, swollen, aching feet and backache. It you work on hard concrete sufaces, TuliGEL Personal Fatigue Mats can make a real difference in how you feel. TuliGEL Energy Tracks, a completely new concept in athletic foot protection. The unique rib configuration actually stores and releases impact energy, helping to improve your overall performance. The Energy Tracks ability to absorb shock will reduce fatigue and may actually help lower the incidence of injury. The bult-in heel cup provides lateral support for greater stability. Designed to be the most comfortable, longest lasting, universal, full-length insoles on the market. A contoured layer of lightweight polyurethane is bonded to closed-cell nitrogen- injected Spenco® material to provide outstanding cushioning and foot stability. Available in ¾ or full length. Distributes pressure and helps position the foot correctly to relieve heel pain. Supports and absorbs shock in the heel and arch areas. Gel Metatarsal Arch Cushions by Spenco®, provide support and comfort for the metatarsal arch. An antimicrobial top cloth helps keep the cushion in place and eliminate odor causing bacteria while the anatomical cushioning system absorbs impact and shock where the metatarsals need it most. For walking, running and jogging. 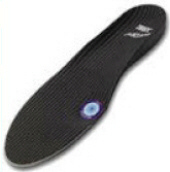 Special “heel strike” cushioning delivers optimum shock absorption for repetitive rear foot impact. Seven sizes fit youth, men’s 6-15, women’s 3-12.